Greenville Business and Professional Women’s Club Treasurer Dorothy Poeppelman (left) receives a donation from BPW member Deb Smith (right). GREENVILLE – Greenville Business and Professional Women’s Club member Deb Smith has chosen to donate $200 to BPW. Smith is an employee of Mercer Savings Bank. Through Mercer Savings Bank’s Giving Mission, each month three employees are selected to choose a charitable organization to receive a $200 donation. Employees are requested to choose organizations that exemplify the values of the Bank as a whole. Smith chose the Greenville Business and Professional Women’s Club. The Greenville BPW Club thanked Smith and Mercer Savings for this donation. 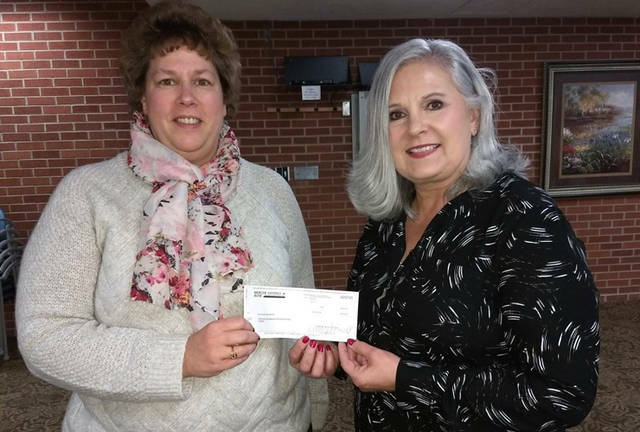 The money has been earmarked for the scholarship fund that lends support to the young women of Darke County continuing their education. The Greenville BPW Club’s mission is to achieve equity for all women in the workplace through advocacy, education and information. The club holds fundraisers through the year to raise money to grant scholarships to the young women of Darke County. The club meets the second Thursday of every month for a dinner meeting.